Optimum Hyper Wool Foam Pad is the first and only hybrid wool pad of its kind that can be used with a DA polisher to remove 1,000 or finer wet sanding marks. Therefore the combination of Zen tool DA Polisher and Optimum Hyper Wool Foam Pad provides results that could only be achieved by rotary polishers and twisted wool pads in the past! 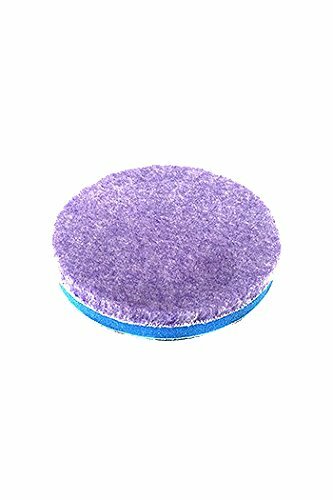 The advantages of Optimum Hyper Wool Foam Pad with Zen tool DA Polisher is a greater cut than rotary buffers with minimal marring and no swirl marks. DIRECTIONS: To remove 1,000 grit or finer sanding marks spray Optimum Hyper Compound on the Optimum Hyper Wool Foam Pad using Zen tool DA Polisher at speed of 3-4 or a rotary buffer at 1200-1400 RPM. This combination will remove (not hide) scratches after 1-2 passes and leave a finish with minor marring that is free of swirl marks. Follow up with Optimum Hyper Polish and Optimum Black Waffle Foam Pad to refine the paint surface before applying Optimum Car Wax. If you have any questions about this product by OPT, contact us by completing and submitting the form below. If you are looking for a specif part number, please include it with your message.